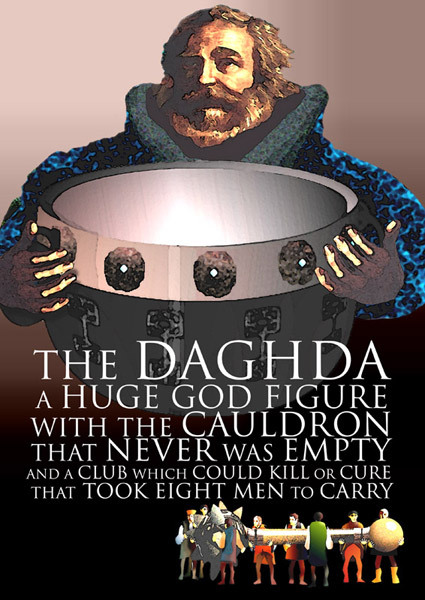 The Daghda had many wonderful possessions: his cauldron of plenty, which never ran empty, and could feed as many man as sat down to it; his mighty club, one end of which could kill a man, and the other end of which could restore him to life. But perhaps his greatest treasure was his harp, Uaithne, called the Four-Angled Music. It was made of oak and richly decorated, and only the Daghda could get music from it strings. He could make anyone who heard it laugh for joy, or weep with sorrow, and the playing of this harp made the seasons come in the correct order. When the Fomorians were preparing to fight the Tuatha de Dannan in the second Battle of Moytura, a few of their warriors heard of the Daghda’s wonderful harp. He used to use when the men were going into battle. His playing would make them forget all their fear, and charge into the fight thinking of nothing but honour and bloodlust. And at the end of a day’s fighting, he would play for the warriors who survived as they came home, and his song would take all the weariness out of their hearts, and let them forget their grief for their fallen comrades, and think only of the glory they had won. They decided that it would be a great blow to the Tuatha de Dannan if they could get hold of this marvelous harp, and keep the Daghda from using it. And so, while the battle was raging, and his home was unguarded, a few Formorian warriors crept in, and stole the Daghda’s magic harp away. They fled as far and as fast as they could, taking their wives and children with them. They were hopeful that their side would win the battle, with the great and terrible Balor leading the Formorian forces, but nothing is ever certain in a war, and so they took refuge in a deserted castle to wait for news, and they hung the Daghda’s harp up on the wall. Before too long, the defeated remains of the Formorian army began to trickle down the road towards them, and they knew that their side had lost the battle. They consoled themselves with the fact that they had taken one of the Daghda’s treasures, and made sure that they were all between the harp and the door, in case anyone came to retrieve it. Ogma the Artificer, and Lugh of the Long Arm stood up straight away, and volunteered to get the Dagda’s harp back from the Formorians. They set forth at once, and travelled long and hard in search of the remains of the Formorian army. At last they came to the deserted castle where the Formorians had made their camp, and they could see there the Dagda’s harp hanging on the wall. Ogma looked at the great mass of Formorian warriors sleeping before them, who greatly outnumbered the three of them, and wondered how they were going to get past them, but the Daghda stretched out his arms, and called out to his harp. And the harp sprang of the wall and ran straight to him. The Daghda struck the strings with his hand, and called out the Music of Mirth. In spite of themselves, the Formorians began to laugh. They laughed so hard that the weapons slipped out of their hands, and their feet began to dance. But when the music stopped, they snatched up their weapons again, and started to advance. Then Ogma said to the Daghda: “I think you’d better play your harp!” And this time, when the Daghda struck the strings, he called forth the Music of Grief. All of the Formorians began to weep. The children wailed, and the men hid their faces in their cloaks so that no one would see the floods of tears they were in. But when the music faded, they took up their weapons again. And then the Daghda struck the strings of his harp so softly that it seemed it would not make a sound. But he brought forth the Music of Sleep, and, though they struggled to keep their eyes open, every last Formorian fell down into slumber. And Lugh, and Ogma, and the Dagda left them sleeping there, and stole away. And never again was the harp of the Daghda stolen.